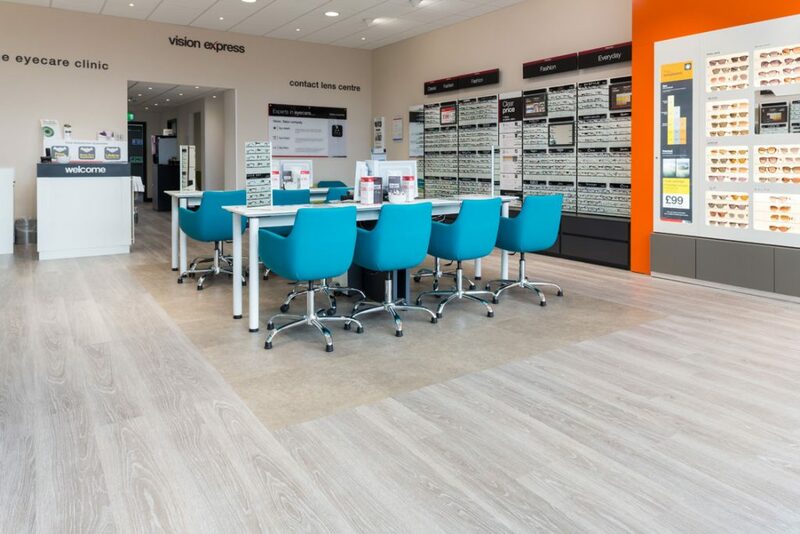 Luxury vinyl tiles from Polyflor’s hardwearing and design-led Expona range were chosen by high street opticians Vision Express to create a fresh and contemporary look for its new store in Cheshunt, Hertfordshire. 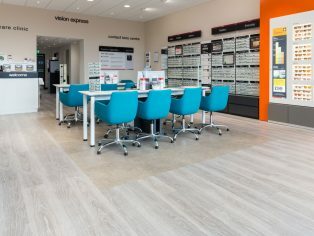 Two stunning designs from the Expona Commercial PUR collection were chosen for the Vision Express store at Brookfield Retail Park and were installed by Floortec Ltd flooring contractors. A mix of wood and stone effect designs were used on the shop floor, with a large square of the Warm Grey Concrete design placed in the middle of the room, surrounded with the Grey Limed Oak wood effect shade. This grey oak design was also fitted throughout the eye testing suites at the back of the store. The Expona Commercial luxury vinyl tile collection features 55 eye catching wood, stone and effects design options for use in heavy commercial environments such as the retail sector. Luxury vinyl tiles in contrasting colours and textures can be laid alongside each other like at this Vision Express store to create an eye-catching look, highlight sales displays, create zones and indicate walkways to guide customers around retail spaces. With a 2.5mm gauge and 0.55 wear layer, the Expona Commercial collection is designed to meet the demands of retail interiors where there are high levels of foot traffic. These luxury vinyl tiles are also further enhanced with PUR, Polyflor’s exclusive and robust polyurethane reinforcement which is cross linked and UV cured to provide superior cleaning benefits. Polyflor has also recently launched a brand new brochure to present creative flooring concepts for retail interiors using luxury vinyl tile and sheet vinyl products. The brochure also features a wealth of case studies where Polyflor flooring has been used for retail installations around the world. Visit the Polyflor website to read online or order your free copy.